The free update of the Dim D Chorus is available. Our Dim D Chorus is a replication of the SDD-320 Dimension D chorus build by Roland. This chorus is famous for delivering a subtle, stereoizing enhancing, airy effect while adding more presence to a sound. Most chorus products give a lot of modulation and do not keep the original structure of the sound in tact. This chorus is way more subtle and adds something and does not take away the original quality of the sound.On our review page you can see the extensive reports of people using this new plug-in. 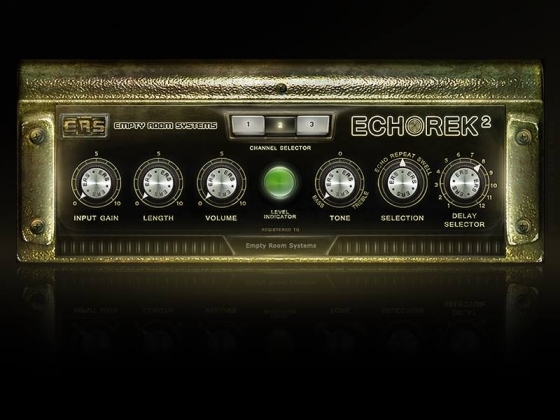 ERS EchORek2 Delay is a replica of the Binson Echorec2 delay. This package contains a licence for one license-owner and can be used on all computers the license-owner uses. EMpTy 250 reverb PC/MAC VST/AU version, the already famous recreation of the EMT-250 reverb. The reverb is known for its very lush and rich sounds on for example vocals and percussive instruments. Please make an account on the website before buying products! The license is for all computers you own. It supports: 44.1/48/88.2/96 kHz Mono, stereo and 5.1 Surround 32/64 bits PC /MAC VST / MAC AU / MAC AAX64.